Nos.1-3 is essentially to be regarded as interrelated, essentially a variation on a theme. 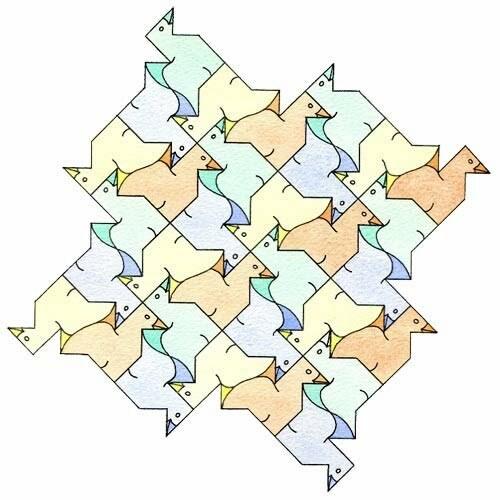 As such, the geometric outline remains identical throughout, the difference being the curved arc of the wing which is shown in two distinct ways in No.1 and 2, thus giving distinct tessellations, albeit of a like nature. No.3 combines both of these. To emphasise the four orientations of the motif, four colours are thus used, although three would have sufficed. However, three colours would be 'inelegant' as according to the inherent symmetry. For comments pertaining to this and its colouration, see No.1. 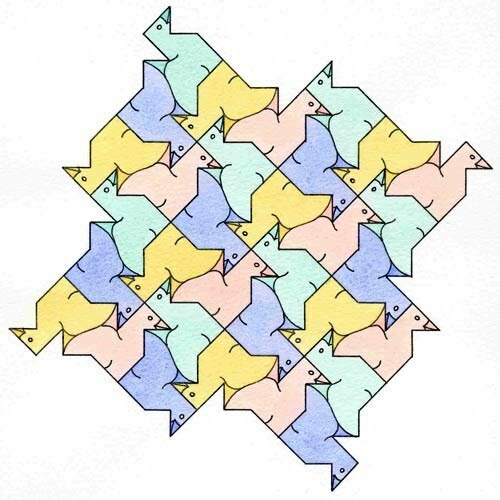 Although the bird motif is somewhat contrived and 'simple', within its limitations a more than satisfactory tessellation ensues. 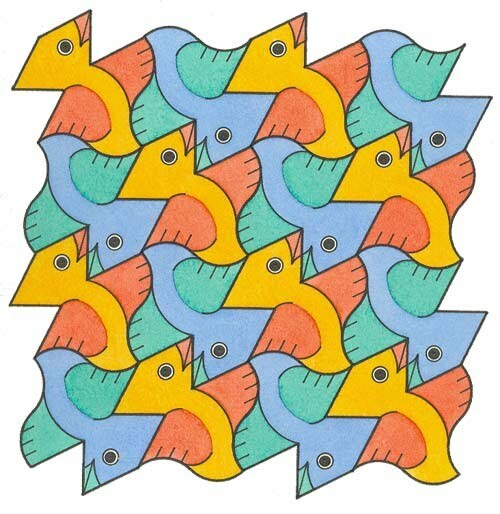 Indeed, its very simplicity can be said to add to its merits, showing that supposed 'complexity of outline' is not a prerequisite to a quality tessellation. 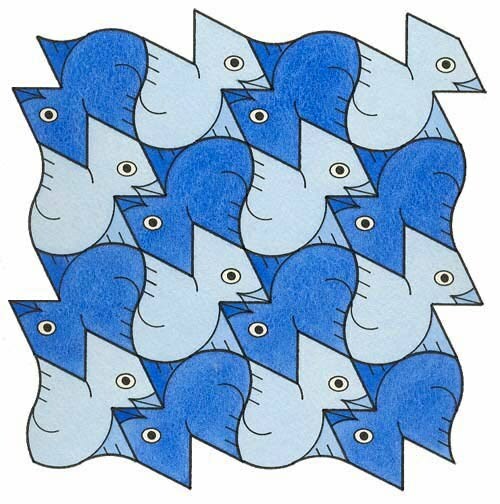 Here the colouring scheme is one of monochrome, with two shades of light and dark blue, these being of sufficient contrast to differentiate adjacent motifs. 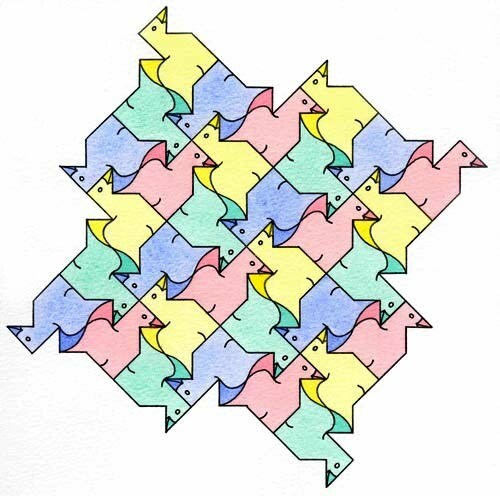 A typical example of a high-quality tessellation from such a simple outline. Perhaps of most note is the colouration scheme, which is somewhat more complex than normal (in relative terms). Essentially this shows a variation of the minimum two colours. Each bird is of two colours, with a predominant core of a head and body of a single colour, with wings and beak of another. As the motif appears in two orientations, this thus necessitates two colours, with orange and blue (body), red and green (wings). These colour combinations were specially selected, being complementary colours (of maximum colour contrast) on the colour wheel. Consequently, despite consisting of four colours, and thereby with the 'potential' for indistinctness, such a considered colouring scheme thus retains individual distinction of the motifs.